Muscles are described using unique anatomical terminology according to their actions and structure. There are three types of muscle tissue in the human body: skeletal, smooth, and cardiac. Skeletal striated muscle, or "voluntary muscle", primarily joins to bone with tendons. Skeletal muscle enables movement of the bones of the human skeleton and maintains posture. Smooth muscle tissue is found in parts of the body where it conveys action without conscious intent. The majority of this type of muscle tissue is found in the digestive and urinary systems where it acts by propelling forward food, chyme, and feces in the former and urine in the latter. Other places smooth muscle can be found are within the uterus, where it helps facilitate birth, and the eye, where the pupillary sphincter controls pupil size. Cardiac muscle is specific to the heart. It is also involuntary in its movement, and is additionally self-excitatory, contracting without outside stimuli. 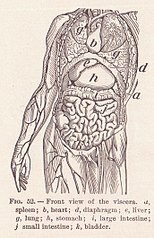 As well as anatomical terms of motion, which describe the motion made by a muscle, unique terminology is used to describe the action of a set of muscles. Agonist muscles and antagonist muscles refer to muscles that cause or inhibit a movement. Agonist muscles cause a movement to occur through their own activation. For example, the triceps brachii contracts, producing a shortening contraction, during the up phase of a push-up (elbow extension). During the down phase of a push-up, the same triceps brachii actively controls elbow flexion while producing a lengthening contraction. It is still the agonist, because while resisting gravity during relaxing, the triceps brachii continues to be the prime mover, or controller, of the joint action. Agonists are also interchangeably referred to as "prime movers," since they are the muscles considered primarily responsible for generating or controlling a specific movement. Another example is the dumbbell curl at the elbow. The "elbow flexor" group is the agonist, shortening during the lifting phase (elbow flexion). During the lowering phase the "elbow flexor" muscles lengthen, remaining the agonists because they are controlling the load and the movement (elbow extension). For both the lifting and lowering phase, the "elbow extensor" muscles are the antagonists (see below). They lengthen during the dumbbell lifting phase and shorten during the dumbbell lowering phase. Here it is important to understand that it is common practice to give a name to a muscle group (e.g. elbow flexors) based on the joint action they produce during a shortening (concentric) contraction. However, this naming convention does not mean they are only agonists during shortening. This term typically describes the function of skeletal muscles. Antagonist muscles are simply the muscles that produce an opposing joint torque to the agonist muscles. This torque can aid in controlling a motion. The opposing torque can slow movement down - especially in the case of a ballistic movement. For example, during a very rapid (ballistic) discrete movement of the elbow, such as throwing a dart, the triceps muscles will be activated very briefly and strongly (in a "burst") to rapidly accelerate the extension movement at the elbow, followed almost immediately by a "burst" of activation to the elbow flexor muscles that decelerates the elbow movement to arrive at a quick stop. To use an automotive analogy, this would be similar to pressing your gas pedal rapidly and then immediately pressing the brake. Antagonism is not an intrinsic property of a particular muscle or muscle group; it is a role that a muscle plays depending on which muscle is currently the agonist. During slower joint actions that involve gravity, just as with the agonist muscle (mentioned above), the antagonist muscle can shorten and lengthen. Using the example above of the triceps brachii during a push-up, the elbow flexor muscles are the antagonists at the elbow during both the up phase and down phase of the movement. During the dumbbell curl, the elbow extensors are the antagonists for both the lifting and lowering phases. The antagonistic pair of biceps and triceps working to flex the elbow. Antagonist and agonist muscles often occur in pairs, called antagonistic pairs. As one muscle contracts, the other relaxes. An example of an antagonistic pair is the biceps and triceps; to contract, the triceps relaxes while the biceps contracts to lift the arm. "Reverse motions" need antagonistic pairs located in opposite sides of a joint or bone, including abductor-adductor pairs and flexor-extensor pairs. These consist of an extensor muscle, which "opens" the joint (by increasing the angle between the two bones) and a flexor muscle, which does the opposite by decreasing the angle between two bones. However, muscles don't always work this way; sometimes agonists and antagonists contract at the same time to produce force, as per Lombard's paradox. Also, sometimes during a joint action controlled by an agonist muscle, the antagonist will be slightly activated, naturally. This occurs normally and is not considered to be a problem unless it is excessive or uncontrolled and disturbs the control of the joint action. This is called agonist/antagonist co-activation and serves to mechanically stiffen the joint. Not all muscles are paired in this way. An example of an exception is the deltoid. 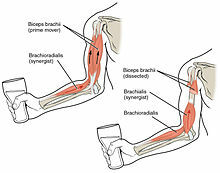 The biceps brachii flexes the lower arm. The brachioradialis, in the forearm, and brachialis, located deep to the biceps in the upper arm, are both synergists that aid in this motion. Synergist muscles perform, or help perform, the same set of joint motion as the agonists. Synergists muscles act on movable joints. Synergists are sometimes referred to as "neutralizers" because they help cancel out, or neutralize, extra motion from the agonists to make sure that the force generated works within the desired plane of motion. Muscle fibers can only contract up to 40% of their fully stretched length. Thus the short fibers of pennate muscles are more suitable where power rather than range of contraction is required. This limitation in the range of contraction affects all muscles, and those that act over several joints may be unable to shorten sufficiently to produce the full range of movement at all of them simultaneously (active insufficiency, e.g., the fingers cannot be fully flexed when the wrist is also flexed). Likewise, the opposing muscles may be unable to stretch sufficiently to allow such movement to take place (passive insufficiency). For both these reasons, it is often essential to use other muscles, called fixators or synergists, in this type of action to fix certain of the joints so that others can be moved effectively, e.g., fixation of the wrist during full flexion of the fingers in clenching the fist. Synergists are muscles that facilitate the fixation action. There is an important difference between a helping synergist muscle and a true synergist muscle. A true synergist muscle is one that only neutralizes an undesired joint action, whereas a helping synergist is one that neutralizes an undesired action but also assists with the desired action. A muscle that fixes or holds a bone so that the agonist can carry out the intended movement is said to have a neutralising action. A good famous example of this are the hamstrings; the semitendinosus and semimembranosus muscles perform knee flexion and knee internal rotation whereas the biceps femoris carries out knee flexion and knee external rotation. For the knee to flex while not rotating in either direction, all three muscles contract to stabilize the knee while it moves in the desired way. Composite or hybrid muscles have more than one set of fibers that perform the same function, and are usually supplied by different nerves for different set of fibers. For example, the tongue itself is a composite muscle made up of various components like longitudinal, transverse, horizontal muscles with different parts innervated having different nerve supply. The insertion and origin of a muscle are the two places where it is anchored, one at each end. The tissue of the attachment is called an enthesis. The origin of a muscle is the bone, typically proximal, which has greater mass and is more stable during a contraction than a muscle's insertion. For example, with the latissimus dorsi muscle, the origin site is the torso, and the insertion is the arm. When this muscle contracts, normally the arm moves due to having less mass than the torso. This is the case when grabbing objects lighter than the body, as in the typical use of a lat pull down machine. This can be reversed however, such as in a chin up where the torso moves up to meet the arm. The insertion of a muscle is the structure that it attaches to and tends to be moved by the contraction of the muscle. This may be a bone, a tendon or the subcutaneous dermal connective tissue. Insertions are usually connections of muscle via tendon to bone. The insertion is a bone that tends to be distal, have less mass, and greater motion than the origin during a contraction. A: fusiform. B: unipennate. C: bipennate. Muscles may also be described by the direction that the muscle fibres run in. Fusiform muscles have fibres that run parallel to the length of the muscle, and are spindle-shaped. For example, the pronator teres muscle of the forearm. Unipennate muscles have fibres that run the entire length of only one side of a muscle, like a quill pen. For example, the fibularis muscles. Bipennate muscles consist of two rows of oblique muscle fibres, facing in opposite diagonal directions, converging on a central tendon. Bipennate muscle is stronger than both unipennate muscle and fusiform muscle, due to a larger physiological cross-sectional area. Bipennate muscle shortens less than unipennate muscle but develops greater tension when it does, translated into greater power but less range of motion. Pennate muscles generally also tire easily. Examples of bipennate muscles are the rectus femoris muscle of the thigh, and the stapedius muscle of the middle ear. Hypertrophy is increase in muscle size from an increase in size of individual muscle cells. This usually occurs as a result of exercise. ^ Taber 2001, pp. "Agonist". ^ Baechle, Thomas (2008). Essentials of Strength Training and Conditioning. USA: National Strength and Conditioning Association. ISBN 978-0-7360-8465-9. ^ Taber 2001, pp. "Antagonist". ^ Martini, Frederic; William C. Ober; Claire W. Garrison; Kathleen Welch; Ralph T. Hutchings (2001). Fundamentals of Anatomy and Physiology, 5th Ed. Prentice Hall. ISBN 0130172928. J. A. Simpson, ed. (1989). The Oxford English dictionary. Oxford: Clarendon Press. ISBN 9780198611868. This page was last edited on 11 February 2019, at 03:27 (UTC).